Well, the holidays are behind us. The time of festive fun and great food, sparkling lights and age-old traditions…families gathering around to spend time together. Perhaps to Netflix and Chill together. Or in this case, Amazon and Kick It together? The television is at the top of the list of great time-passers as you wait for your turkeys to roast and/or your latkes to fry. You can gather ’round and watch some instant classic football games, a classic holiday movie or even experience a bit of completely new and cutting edge mind-mushing, brain-bashing, reality-wrecking episodic television. This year, I got treated to such an experience when my family decided to forge ahead with their viewing of Amazon’s award-winning Mozart in the Jungle, even though I’m still on Season 1. I was totally fine with skipping ahead as I’m not terribly invested in the show. I found it to simply satisfy the need for a half-hour bit of comedy decompression after an intense drama like its Amazonian counterpart The Man in the High Castle. Nevertheless, the episode next up on the queue for my family would change everything. It was no comedy to me…it wasn’t quite dramatic either…it was odd, dare I say cubist, almost sans-genre, and it has earned itself a coveted spot here in our Mind Blown series. Episode 7 of Season 3 is titled, “Not Yet Titled” and already the existential crisis-like nature of this episode is established which will hopefully allay your fear of missing out on the previous two and a half seasons. Because what unfolds is a transcendent piece of I-don’t-know-what; a blend of reality as we know it, with the reality and surreality of the show, commenting on the surreality of our reality as we know it. The episode takes a mocumentary approach without mocking anything but instead revealing the freeing power of music on the mind through an experiment, cleverly crafted by the show’s creatives including Roman Coppola and Jason Schwartzman. Schwartzman returns as his on-screen persona, Bradford Sharpe, to lead the charge of this experiment. The subjects? Detainees at Riker’s Island Prison Complex. A real film crew follows a sort-of-faux film crew capturing the real reactions and interviews of real prisoners after a very real concert performance by real and not-so-real musicians (the orchestra in each episode, including this one, is filled out by actual musicians from The Chelsea Symphony and the New Westchester Symphony Orchestra to add authenticity to the on-screen performances alongside the Mozart in the Jungle cast members). To top this whole brain-bender off, the pieces of music chosen for the performance were by Olivier Messiaen. Messiaen wrote the featured works of the episode (such as “Quartet for the End of Time“) while in prison during World War II. 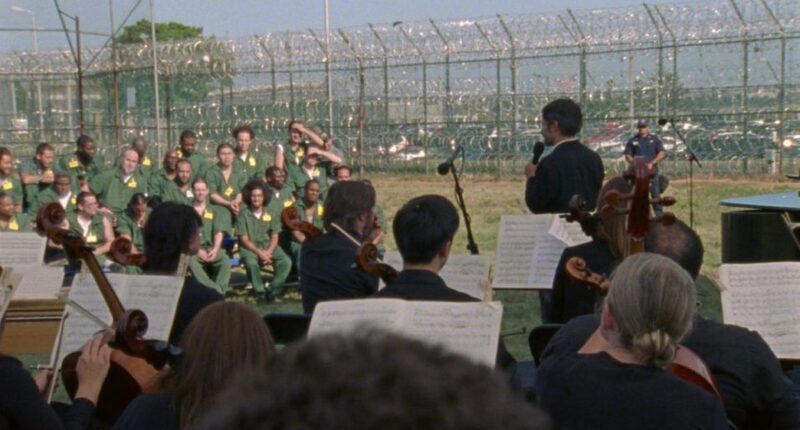 How are these prisoners going to react to an avant-garde orchestral performance, challenging pieces of classical music, that were born out of a man’s captivity? Do yourself a favor and go check out the results. Watch Season 3 of Mozart in the Jungle on Amazon Prime here! The Mozart in the Jungle cast includes Gael Garcia Bernal, Saffron Burrows, Lola Kirke, Bernadette Peters and Malcolm McDowell. Watch out for cameos from all over the music world including Gustavo Dudamel, Joshua Bell and acclaimed pianist Emanuel Ax deeply engaged in a game of Dance Dance Revolution.